The vessel is in great condition with only minor cause medic issues. A minor dent in the fencing at the port aft section of fencing. Interior shows no tears or rips in vinyl seating. 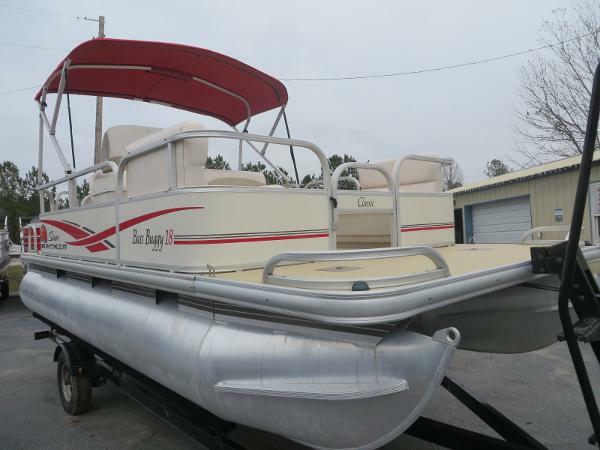 All of the interior, shows well for its age and all of the mechanical are functional as per the owner with the exception of the condition of the trolling motor as the owner has never used it. Stock #175148 Fun for the whole family! GREAT condition. 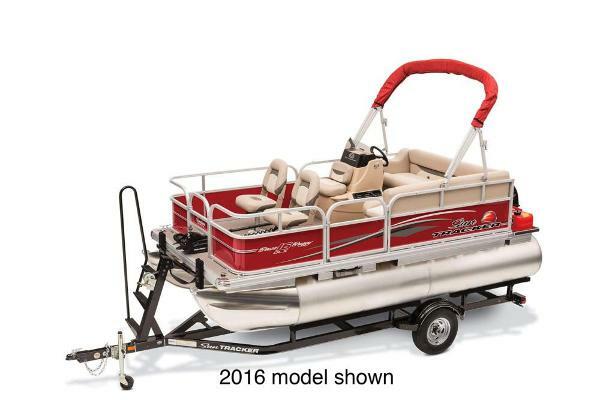 Great for fishing or family fun on the lake! 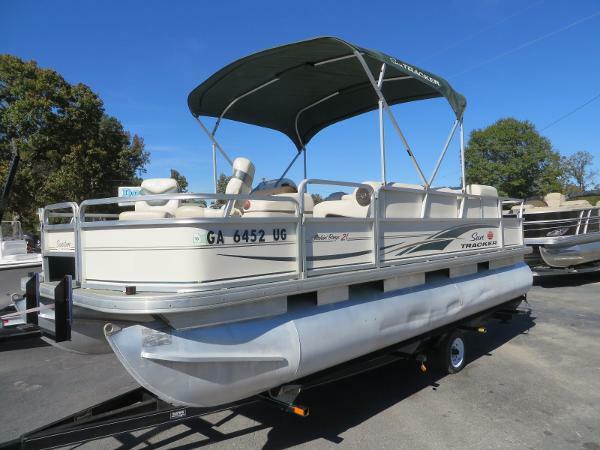 If you are in the market for a pontoon boat, look no further than this 2014 Sun Tracker 22 DLX Fishing Barge, priced right at $21,750 (offers encouraged). 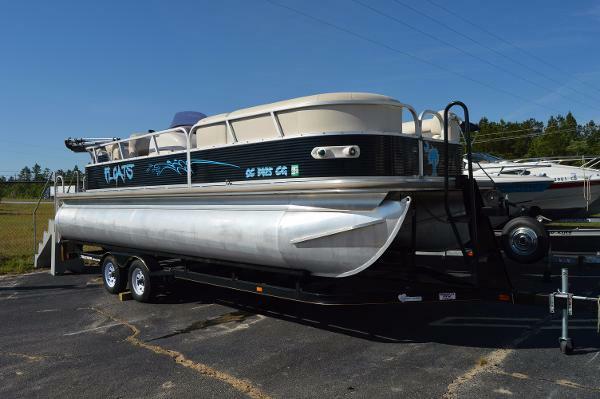 This boat is located in York, South Carolina and is in good condition. She is also equipped with a Mercury engine that has only 68 hours. Reason for selling is moving. 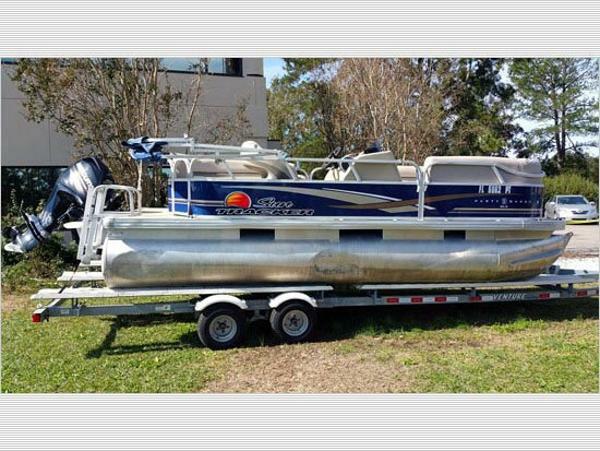 2006 Sun Tracker Party Barge 18 CURRENT PRICE IS A GUIDE. ALL OFFERS RESPECTFULLY CONSIDERED. 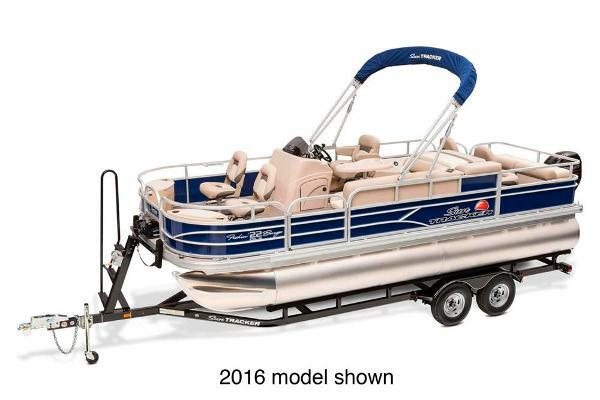 Actual ConditionThe Party Barge by Sun Tracker is an affordable and fun pontoon boat. This one comes with a trailer and 50hp Mercury four Stroke. The seating is in poor condition and will need cosmetic repair. The pontoons, deck, and engine are in good shape. Make an Offer! EquipmentThis sale includes a Trailstar Single Axle Bunk trailer. EnginesPlease read Motors and Machinery Disclaimer. Motors and Machinery DisclaimerNo statement of condition can be made regarding motors, engines or machinery, whatsoever. A photo may appear of the engine compartment and machinery, but it is entirely the buyers responsibility to inspect and determine their actual condition. * On occasion we receive unverified information regarding mechanical condition. 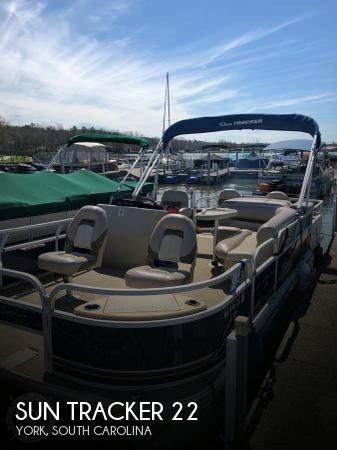 2007 Sun Tracker PARTY BARGE 22 I/O Regency Edition Our luxurious SUN TRACKER PARTY BARGE 22 I/O Regency Edition comes with MerCruiser sterndrive for quiet operation and increased fuel economy. Creature comforts include an extra-wide padded sundeck with pop-up changing room and bench, plush lounge seating with concealed storage, Sirius-capable AM/FM/CD with integrated MP3 jack, aft entry platform with oversized boarding ladder, removable table with two mounting locations, color-matched 11-foot Bimini top, dual-latch inward-opening gates and dual trash receptacles. 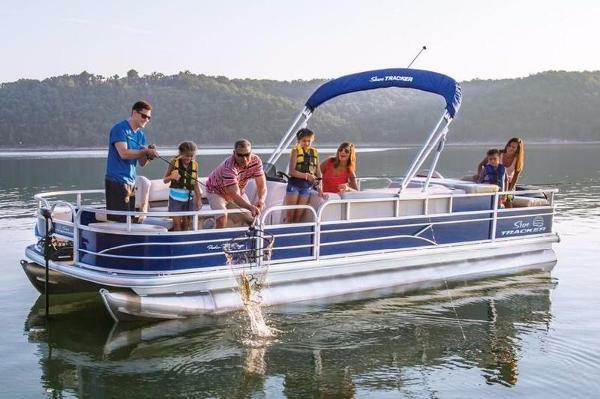 Theres a deluxe helm seat with flip-up bolster, custom console with instrumentation, depth finder, quiet 0.75-inch pressure-treated extra-wide 102-inch deck and 26-inch diameter multichambered pontoons for the smoothest ride in its size range. Optional trailer. 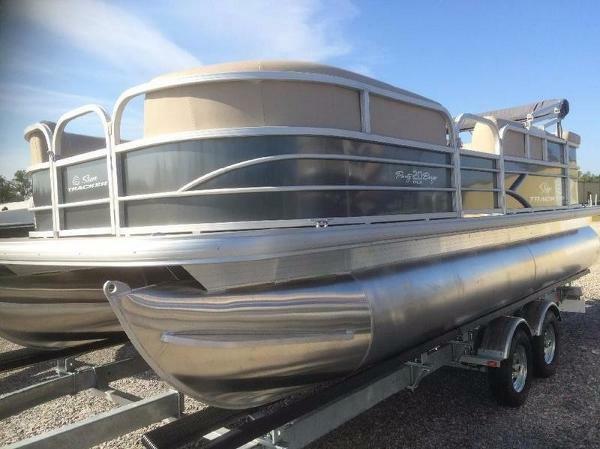 2011 Sun Tracker BASS BUGGY 18 Classic Series High-buoyancy all-welded 24" (60.96cm) multichambered pontoons Open floor plan w/plenty of casting room fore and aft Bow fishing platform: 2 fold-down fishing chairs w/NEW FOR 2011 secure screw-in pedestals Port & starboard bow couchesóeach w/drink holder & NEW FOR 2011 closed rotomolded storage below Captain's console w/NEW FOR 2011 wide bucket seat. Tinted windscreen, small items tray, drink holder, tachometer, fuel gauge & storage area NEW FOR 2011. Floor-level, vertical rod holdersóout-of-the-way in front of the captain's console NEW FOR 2011. Midship passenger bench seat features a flip-flop seatback. 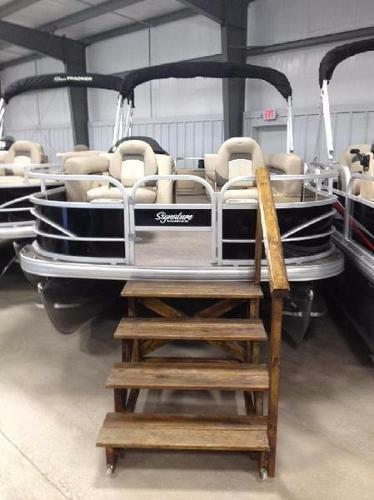 PLUS ADDED VALUE FOR 2011óa rotomolded aerated livewell below "Family-sized" aft couch w/NEW FOR 2011 rotomolded storage below Full-width aft swim platform w/non-skid surface, oversized boarding ladder w/large handrails 6' (1.83 m) color-keyed polyester Bimini top w/protective boot Optional Fish Package w/LowranceÆ X50 DS fishfinder & MotorGuideÆ W55 Wireless Series 12V, 55-lb. 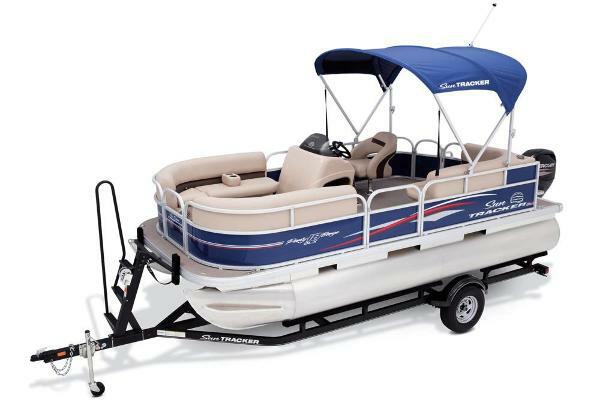 thrust trolling motor w/remote (battery not included) Our original SUN TRACKER BASS BUGGY was the industry's first family fishing pontoon boatóway back in 1983. And it's still a classic today. Each year we keep improving and adapting it to the wants and needs of America's families everywhere. For 2011, we've concentrated on ADDED VALUE and NEW FEATURES with an emphasis on ease of ownership. For instance, this year, we added a flip-flop seatback on the midship passenger seat so you can sit forward or backward as you cruise. And we've added closed, rotomolded storage under all the couches. 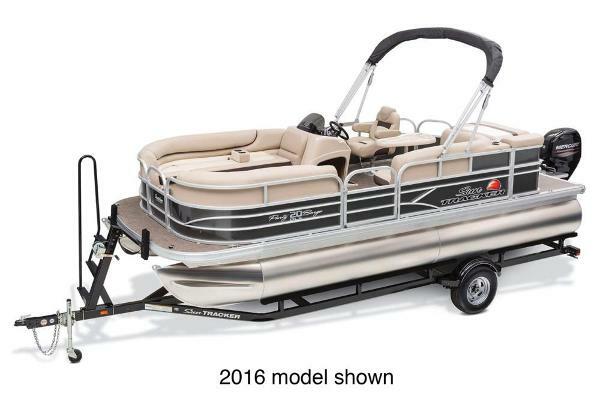 The practical, no-nonsense layout is perfect for families who simply want a basic, easy-to-maneuver, easy-to-own pontoon. There's ample room for a crew of eight, and if your family is serious about fishing, a deep aerated livewell comes standard for 2011. The optional Fish Package adds a bow-mounted trolling motor with wireless remote and a fishfinder. 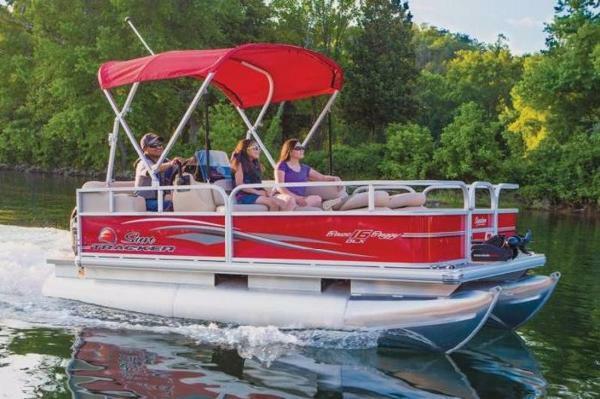 The BASS BUGGY 18 Classic Series lets your family have fun like they've never had fun before. Let the good times begin! 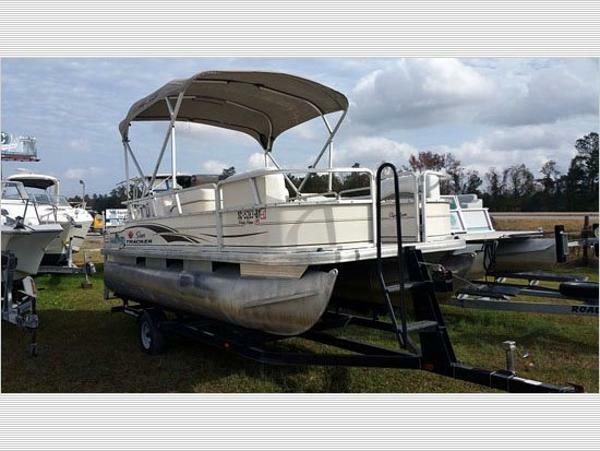 2005 Sun Tracker FISHIN' BARGE 21 Signature Series With more room, more comfort and more conveniences than ever, the FISHIN? BARGE was designed for full-on family fishing fun. 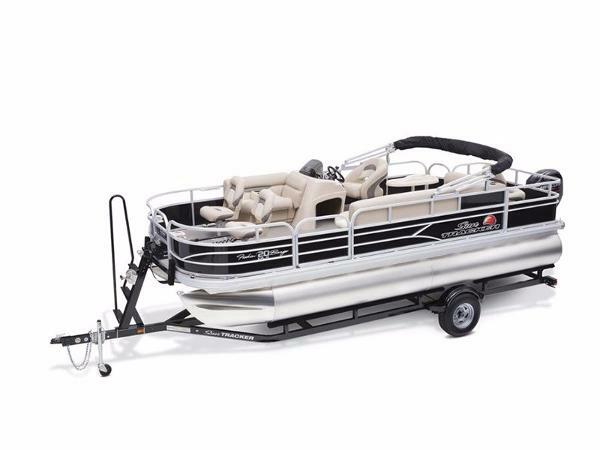 Features like bow tackle storage compartments, fishing seats that can be moved to multiple locations, two aerated livewells and a lockable rod box make this one great fishing platform. When you want to just kick back, there?s a comfortable L-shaped couch and a padded sun deck. Need to change clothes? Duck into the pop-up changing room with built-in bench. Going for a swim? The new aft-entry access with boarding ladder makes getting back on board easier than ever. Whether you?re out for fish or just out for fun, you can count on a smooth ride and years of trouble-free performance.